Trust and Obey? 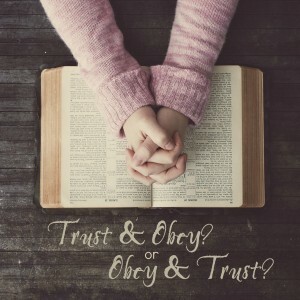 or Obey and Trust? I love the wisdom of women that have gone before me. That is what I’ve received from Cindy Kennedy. 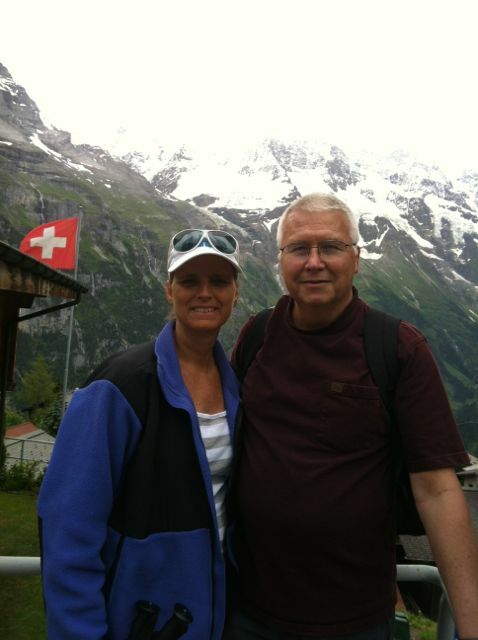 Cindy & her husband, Andy, are the parents of 4 amazing children and serve on the mission field internationally. I love getting share the heart of a woman that I respect and have gleaned so much wisdom from with you. Andy and me in Murren Switzerland about an hour from our home in Lorrach Germany! Turning 50 a few months ago was not as painful as I thought it would be. Maybe because year 49 was filled with so many huge life changes, I just sort of coasted into this birthday. This past year we were asked to leave a country that we had grown to love as our own. After 15 years of missionary life in Brazil, our work and time there was finished. From the time a missionary puts their boots on the ground for the first time, they begin to think about an exit strategy, but most never actually see it happen. So in a blur of tears of goodbyes and butterflies in the stomach about our next assignment, we found ourselves on a plane heading for Germany. Questions of doubt began to bombard me. Can I adapt to this new culture? Will the kids make the transition ok? Will they be accepted in their new school? Will I be able to learn a new language at my age? Will we be affective as missionaries in this spiritually cold and hardened region of our world? As a kid I use to sing an old hymn at church called “Trust and Obey”. But I have to admit, this time I was obeying first and asking God to help me trust Him. John 14:23 is a simple and direct mandate that became my anchor in this new journey: Jesus replied, “Anyone who loves me will obey me. My Father will love them, and we will come to them and make our home with them.” Did I Love Jesus? Well…YEAH! Duh! Then the proof of that love had to be obedience. Although this year has been spent learning a language and helping my family get settled into a new normal, there have been significant ministry opportunities as well. And as usual, those ministry opportunities have led into learning opportunities for me. Just recently God taught me even more about obedience and trust. Last month, I took a group of 16 youth on their first ever youth retreat. My own three teenagers and one other girl were the only ones in the group that had ever made a decision to follow Christ and be baptized. During those three days in the Swiss Alps (don’t be jealous! 😉 God did an amazing work among these teens. Eleven of them prayed to receive Christ that weekend! All of them are second generation Brazilian/ Swiss or Brazilian/German kids. Which means at least one of their parents is probably an atheist or at best agnostic. One boy in particular is named Thomas. He is fourteen and an incredible soccer player. He rarely has a weekend off from soccer but was able to be at the retreat. He gave his heart to Jesus the first night of the retreat. The last morning together before returning home, the kids decided they all wanted to be baptized together and they wanted to do it before everyone started leaving for summer vacations. We talked with the pastor by phone and arranged for the baptism to be the following worship service. The only one with a problem with the date was Thomas. He explained to us that he had a championship soccer tournament that following weekend and I told him not to worry about it, that we would figure it out later or he could wait to be baptized after his return from vacation. 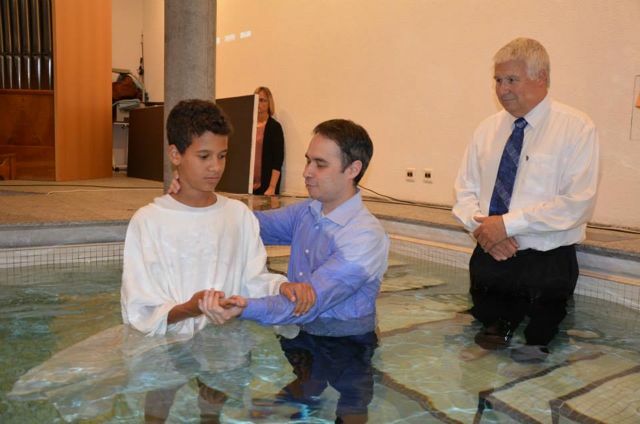 Thomas being baptized two weeks ago. At the Thursday evening prayer meeting before the Saturday baptism, I asked Thomas’s mom if he had talked to the coach. She said, “You’re not going to believe this but the coach sent him a text message this morning and told him not to worry about missing the game because the date of the tournament had been moved to a different weekend!” Thomas showed his mom the text message and said, “See Mom! God took care of the details! Thomas’s first act of obedience after professing his faith did not go unnoticed by God! A young person who was only beginning to learn to trust saw God show up in a big way and reward his step of obedience. My prayer: Please God continue to teach me to trust and obey or help me obey and through that obedience increase my trust! In Jesus’ name…Amen. Question: When have you had to obey and learn to trust?